Your final stop for trustworthy training and nutrition information. I only report the stuff that works. Read up! Learn what it takes to see great results. Got a question or need my help? Let's talk. I’m the Training Director for Men’s Fitness and Muscle&Fitness magazines. I write about and edit workouts, diets, exercise trends, and the regimens of celebrities and athletes. 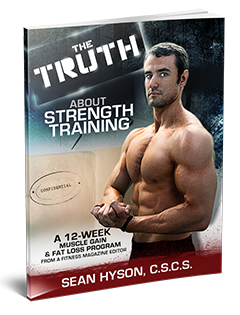 I’m the author of The Men’s Fitness Exercise Bible (aka 101 Best Workouts Of All Time), an Amazon.com best-seller, and the e-book The Truth About Strength Training. After years of working with fitness experts and sifting through the enormous volume of training programs, diets, and supplements that have come across my desk—and being a guinea pig for more than a few of them—I’ve come to a few conclusions. Here, I’ll share with you what really works. It’s long been my job, but it’s always been my passion. This is fitness distilled.